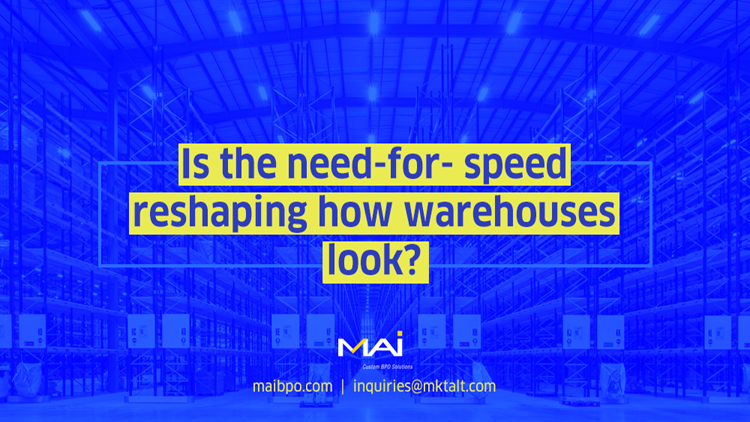 Is the Need-for-Speed Reshaping How Warehouses Look? Today, nearly a half of American households have at least one family member subscribing to Amazon Prime membership. Though the Prime service costs $99 a year, the key attraction to the service is faster delivery! Yes, today consumers are willing to pay more for faster deliveries of their desired products. While this opens up huge avenues for players like Amazon to make more money out of subscription services like Prime, the real challenge is for the warehouse and distribution centers. Meeting intense delivery schedules requires the staff and infrastructure at fulfillment centers to be fine-tuned. Traditional retailers, on the other hand, do not face as much pressure because they typically have stock rooms close to the stores and, even with minimal forecasting of stock-outs, the stores can be well stocked during peak shopping times. However, the penetration of eCommerce has changed many long-standing paradigms. As exemplified by the success of Amazon Prime, it is clear customers are increasingly attracted to the choice and flexibility offered by online shopping and will even embrace additional shipping costs for the convenience of instant deliveries. Rather than large warehouses spread over hectares of land, retail players are investing more in clusters of fulfillment centers to ensure stock remains as close to the demand areas as possible to meet increasing demands for ‘same day’ or ‘next day’ delivery. These fulfillment centers are typically located in core urban areas and enable retailers to serve the needs of consumers faster while also reducing costs that would otherwise be incurred for intermediate storage and transportation to distant warehouses. In addition, distance shipping involves coordination between various modes of transport such as freight-to-truck or air-to-truck which can be adversely and unexpectedly disrupted by numerous factors in the logistics ecosystem. When clusters of fulfillment centers are brought in to handle last mile deliveries, they are usually built on urban centers. The challenge that emerges in this case is that of space crunch and skyrocketing rents. Core city areas are not in a position to offer huge land parcels to set up warehouses. To overcome this challenge, retailers are changing the way warehouses look and function. For example, warehouses are shifting from single floor units to multi-level facilities to increase usable floor space and accessing the higher floors via heavy duty elevators and ramp units. Many ecommerce companies are offering consumers the freedom to choose locker locations closer to their residence and a unique pick up access code to get their deliveries. The parcels are delivered to these lockers. These are essentially pick-up locations from where the customer can directly pick up their goods. Though this does not go well with the principles of home delivery, it does offer a viable solution for both the retailer and the consumer to get faster access to the product. Technology is often a decisive factor in streamlining warehouse and logistics efficiency. Today a number of start-ups are focusing exclusively to help retailers deliver the best experience to their customers. There are Uber-like service models available for retailers to arrange parcel deliveries to their customers. They mobilize a team of delivery men who can communicate both with the distribution centers and the end consumers. The consumer, on the other hand, can view real time status of their parcel delivery and make necessary arrangements to receive it. This works fine with intra-city deliveries much akin to the urban cluster model described earlier. The increasing demand for “instant delivery” has opened up new avenues of disruption within the distribution center and warehouse infrastructure. Retailers can focus on providing the best shopping experience for consumers thanks to these innovative solutions available on the delivery side.